Aquilegia canadensis, or Red columbine. 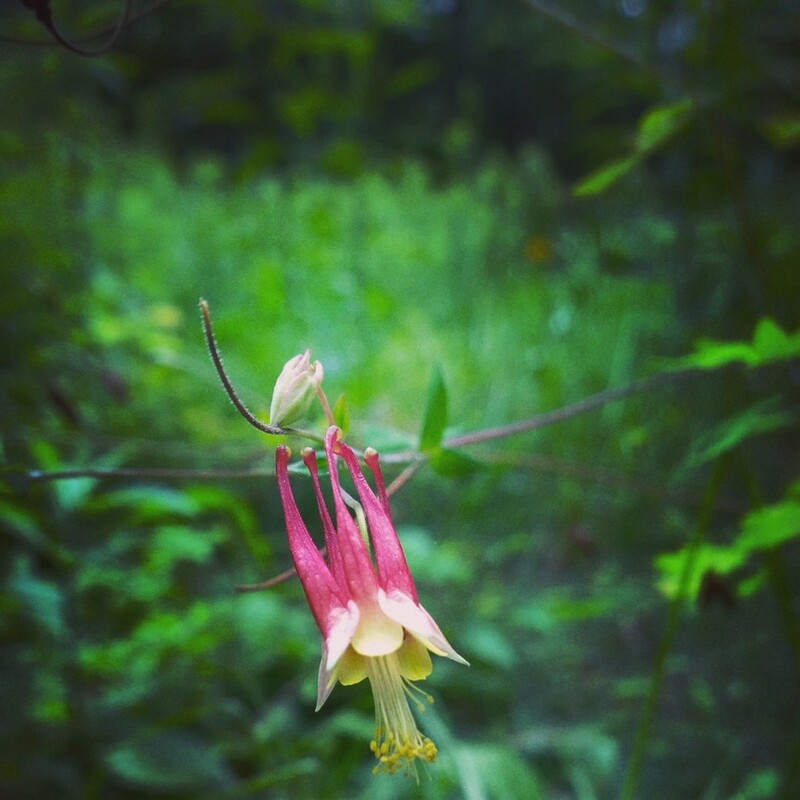 Native American tribes used various parts red columbine in herbal remedies. Canada columbine contains a cyanogenic glycoside, which releases poisonous hydrogen cyanide when the plant is damaged. I always take pictures of this flower when I see it - it's intricate and unique shape awes me. It’s one of those things many of us know by feel, but not necessarily through scientific evidence. We just feel better when we spend time exposed to nature. But many environmental psychologists (they study the psychological effects of natural and built environments on humans) have shown empirically that spending time in nature has real psychological benefits. For example, if you decide to take a walk, forget the treadmill. Do it on a nature trail instead, and a better mood and greater viability, less frustration and lower mental distress may be your rewards. Environmental psychologists have for a while now used the Connectedness to Nature scale to measure people’s cognitive connection to nature. The scale assesses one’s belief that connection to the natural world is an important part of one’s sense of self. Several environmental psychology research studies have shown that people who score high on this scale also report greater concern for the environment as well as greater happiness and social acceptance. But a study published in June this year in the Journal of Environmental Psychology suggests that cognitive connectedness to nature may not be sufficient in itself to produce important psychological well-being outcomes such as satisfaction in life. Do you get a lump in your throat when you see a flock of birds flying in unison? Do you feel awe and wonder when you see a massive redwood tree? Do you get a sense of love for the entire world when you find a beautiful flower in the woods? If you do, you may tend toward greater life satisfaction and well-being – and pro-environmental behavior – than others who are connected to nature but don’t experience this awe in natural beauty. Previous research has found that those of us who perceive natural beauty and are emotionally aroused by it also tend to experience greater life satisfaction and less materialism. So now we know that endorsing greater connectedness with nature and engaging with natural beauty are both associated with greater psychological well-being and environmental conservation. But do we need both to reap the psychological benefits? Campanula punctata (spotted bellflower) is a herbaceous perennial flowering plant in the bellflower family. The flowers and leaves are edible (according to Wiki). They are used as medicinal herbs in Asia - isn't that something! I just think the spotted bell is so pretty. Photo by Paige Brown (that's me). Jia Wei Zhang and colleagues propose that those of us who feel more connected to nature will report greater life satisfaction and self-esteem, but only if we also engage emotionally with nature’s beauty. In a study of over 1,000 adult volunteers via online surveys, these researchers measured the relationship of Connectedness to Nature and Perception of Natural Beauty with Satisfaction with Life (“In most ways my life is close to ideal”). The researchers also controlled for personality traits (openness, agreeableness, extraversion conscientiousness, and neuroticism), age and gender. Who perceives beauty in nature? In Zhang and colleagues’ study, older and female participants reported greater connectedness to nature and perception of nature’s beauty. This is one reason why the researchers had to control for age and gender in their analyses. Using regression models, which allow for prediction of an outcome based on multiple variables plotted against a straight line, Zhang and colleagues found perceiving nature’s beauty to be a significant predictor of life satisfaction while accounting for the other personality and demographic variables. In other words, the more one perceived nature’s beauty, the more one reported life satisfaction (.15 unit increase in life satisfaction for every 1 unit increase in natural beauty perception, to be exact). However, more connectedness to nature did NOT predict greater life satisfaction overall. 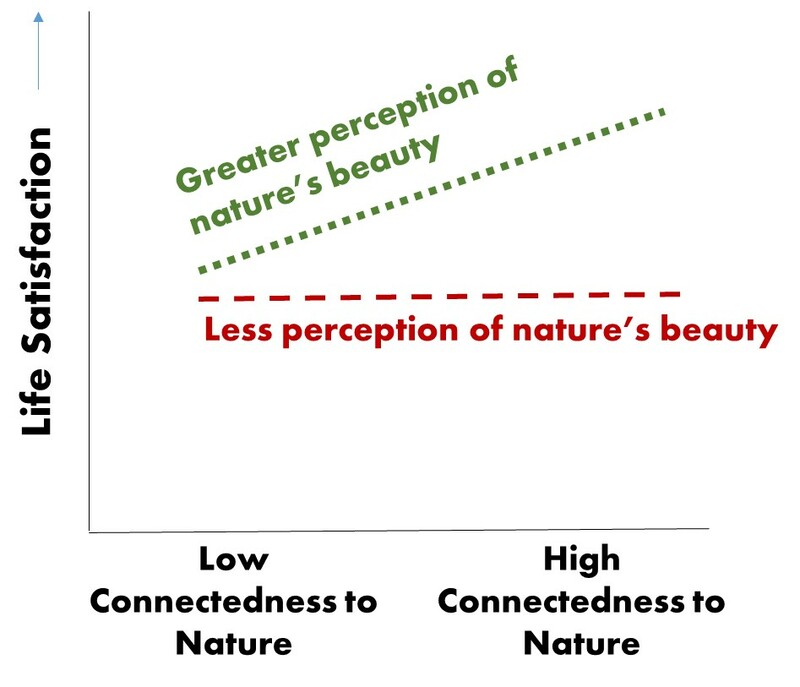 Instead, connectedness to nature only predicts greater life satisfaction when one scores high on perceiving nature’s beauty. This means that we report significantly greater life satisfaction only if we feel more connected to nature and feel awe at natural beauty. Graph reproduced visually from Zhang et al. 2014. My big question at the end of reading this study is: could people be prompted to perceive and appreciate natural beauty more? Is appreciation for nature’s beauty learned? Or do we all have a certain awe for natural beauty that some of us forget or lose at some point? This study follows a long line of research showing positive relationships between connectedness to nature, appreciation for nature and psychological well-being. But it's also important to note that these positive relationships don't necessarily provide evidence that connectedness to nature and perception of natural beauty cause greater psychological well-being. Unless we can experimentally induce people to feel more connected to nature and perceive nature's beauty, or show in field studies that appreciation for natural beauty predicts future satisfaction with life, we can't pull out our "cause and effect" card. For example, what if people experiencing mental distress, depression for instance, don't engage as much with nature's beauty as happy people do? There might be complicated relationships between connectedness with nature, perception of natural beauty and satisfaction with life. But Zhang and colleagues provide solid evidence that these relationships are positive, and that engaging with nature's beauty is an important part of connecting with nature to reap psychological benefits. What about you? Do you stop to admire nature's beauty? 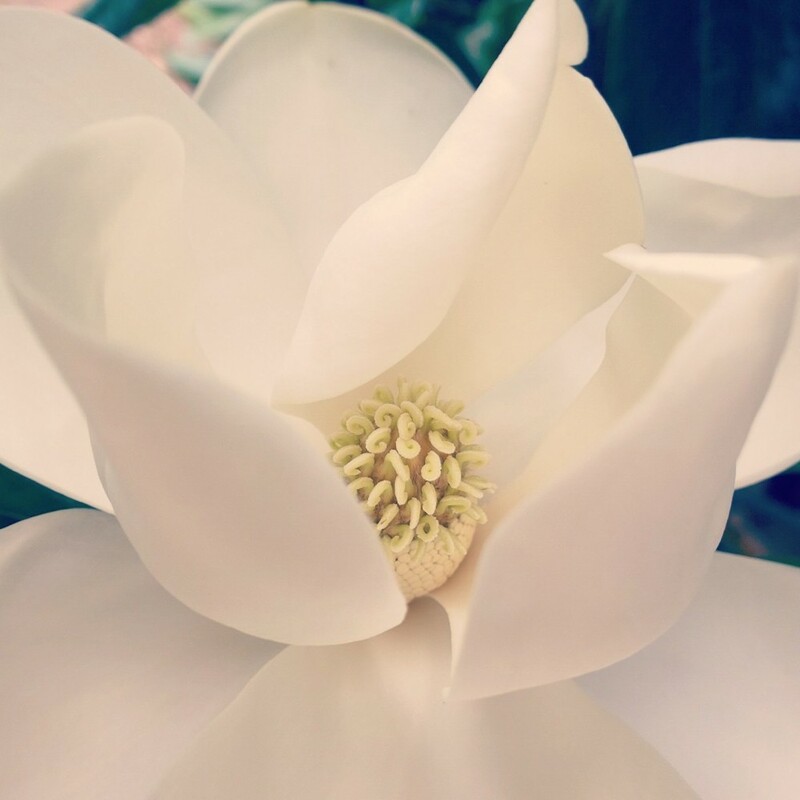 If the magnolia flower isn't awe-inspiring, I don't know what is.